Mr. White, a renter, is buying a house from the Greens. The Greens are buying a house from the Blacks. Mr. and Mrs. Black cannot move out, because their loan is not closing due to the government shutdown. Because the Blacks’ loan isn’t closing, the Greens and Mr. White are also blocked from their home purchase transactions going through. This is a true story, names changed. Because home buying is often a “domino effect,” the government shutdown is blocking more loan closings than it might appear on the surface. I’ll explain. Lenders who sell their loans to Fannie Mae are required to verify the borrowers’ social security numbers and tax returns. The government agency that does the verifications is shut down. Some banks and mortgage companies are allowing their loans to close without the verification, with the stipulation that the verifications will be done as soon as the agency reopens. So even though the loans are closed, it still must be done. However, not all lenders want to take that chance. If the verifications do not come back with satisfactory information, the lender must unfund the deal, which is a costly hassle. Lenders have their individual tolerance levels for taking such a risk. In addition, the USDA loans (loans for certain neighborhoods with income limits) cannot close at all until the U.S. government reopens, so all those loans are in wait mode. There is an even bigger financial domino effect on the economy when loans don’t close. The six real estate agents involved with the White, Green, and Black transactions are not receiving their commissions. The three loan officers do not receive their commissions. The three loan processors don’t receive their file bonuses. That is money they don’t have to spend on a celebratory dinner out, which affects the restaurant business. Potentially, three moving companies lost income. New furniture and appliances will not be purchased. Pizza delivery for moving day is not happening. In turn, the people in the food and furniture industries do not have that income to spend on clothing and other things. On and on it goes with lost money to put into the economy. 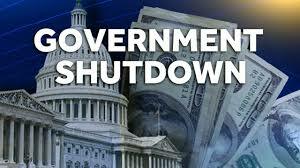 Experts say the U.S. economy has suffered by $2 billion so far due to the government shutdown, and the real estate industry is a part of that. I don’t give political advice, but personally, I will not be voting for any incumbents at the next election. Let’s hope we get some good news from Washington D.C. soon.